Low cost pen for your stress-free writing solutions. Imprint: Price includes a 1-location, 1-color imprint only. Shipping weight: 6lbs. per 200. Bulk packaged. German ink used in all pens. Black ink. 500 1 color(s) imprint at $304 ONLY $0.61 each. 1000 1 color(s) imprint at $476 ONLY $0.48 each. 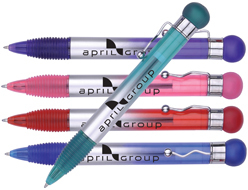 2500 1 color(s) imprint at $1,073 ONLY $0.43 each. 5000 1 color(s) imprint at $2,061 ONLY $0.41 each. 10000 1 color(s) imprint at $4,070 ONLY $0.41 each.